Well, I guess my blog is still here. The reason I say that is when I went to write my post last night for the TCP Haunted Hop, Blogger had sent me a message that my blog had been reported as Spam! So which one of you did that? Does someone have it in for me? Just kidding! I think it had to do with me putting a lot of links in my posts and then some kind of filter Blogger uses flagged it mistakenly as a spam blog. That was scary, because it said that they needed to review it and if it came up "spammy", they were going to DELETE my blog altogether! That would be a SAD SAD day in Susieville. But it looks like we're back to normal, so onward and upward we go. Anyway, I have a fun little project to show ya'll today. 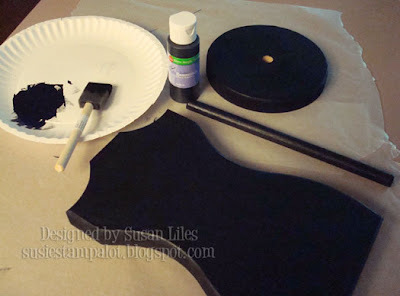 It's been a while since I shared anything from Glue Art and Paper Studio, so when I got the assignment to make something fall or Halloween, I couldn't wait to get started on this larger Dress Form I had from them. 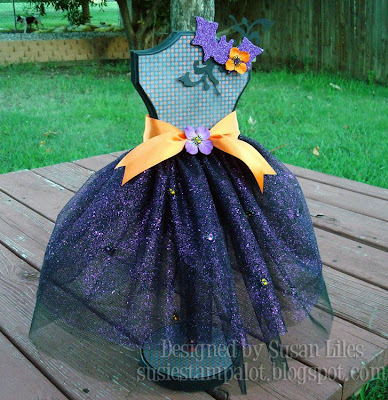 The Dress Form comes in three different sizes and in three parts for ease of decorating. In fact, they are on sale right now! This one is the biggest one, standing about 20" tall, put together. I painted each piece black (I had to. Audrie had colored on the base with red crayon! ), and then covered the bodice and base with some cool paper I got at The Scrapper's Boutique over in NRH. Then I thought it would be fun to paint some orange stripes on the stick part to resemble witch's stockings! Then I started on the skirt. 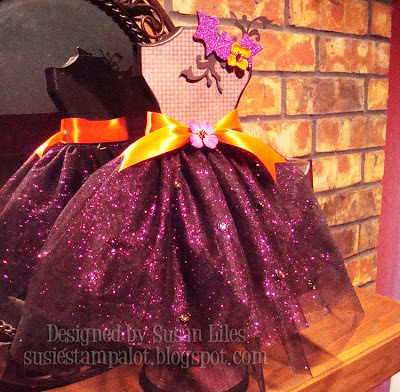 I sewed gathering stitches across the top of 3 different kinds of tulle (I wanted to be sure it was nice and poofy!) and pulled them until it was gathered enough to fit over the dress form. I then had to pull the stitches just a bit more to tighten them up and then hand sewed them down to anchor the gathered stitches. Hot glue helped me out at this point as well, as I glued down the gathered area. Mission accomplished: it's poofy all right!! 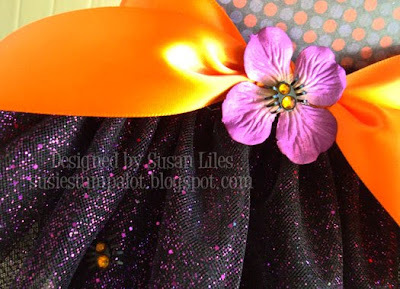 I added some fun rhinestone spider brads from Making Memories to the skirt part and the middle of her Prima flower to finish off her big orange satin ribbon belt. I just couldn't pass those up when I saw them at Michael's! They're from their new Spook Alley line. So cute! For the last touch, I used a blank wood bat and painted him black. After that dried, I covered the top of it with glue and dumped this perfect PURPLE German Glass Glitter from The Cat's Pajamas on top of it. It matches the glittery purple tulle perfectly! We then left the house to go eat dinner in order to let it dry. That was an important step. 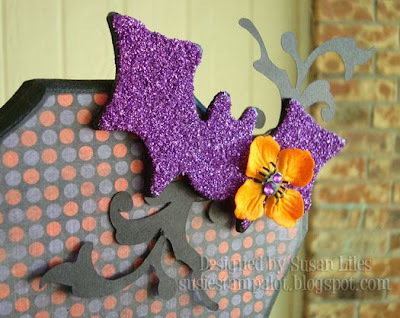 When we got back, I cut the swirlies with my Basics 3 card and my Slice Machine, added the orange Prima flower with another sparkly spider and hot glued it onto her shoulder for a nice broach! So my little witchy is ready for the Halloween Ball! I think she turned out so pretty! I'd love to make another one and make it super scary!! Now I just need to make a pumpkin coach like Cinderella had and we'll be all set!! OK, first this dress is AMAZING! The details you put into this just amazes me! Second, SPAM? DELETE BLOG? ACKKKK! What a close call -whew!! This is just the spooky-cutest darn thang I've seen this Halloween season, Sus! Yikes! I'm so glad you didn't lose your blog Susie! - SCARY indeed!! and I LOVE you wonderful witch dress form! how very CLE-VAH!! and creative! 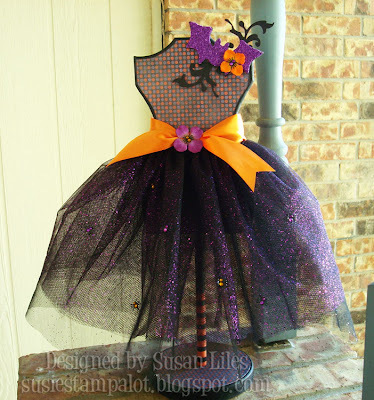 a super decoration for Halloween! and wow - what ideas this is making me think of for other holidays or celebrations! This dress is brilliant! Gorgeous!!! Unique!!! I love it so much! Susan- Get out!!! This is amazing, I absolutely love it!!!! Not very often do I see projects like this that I would want to re-create myself....but I think this is one of them!! !